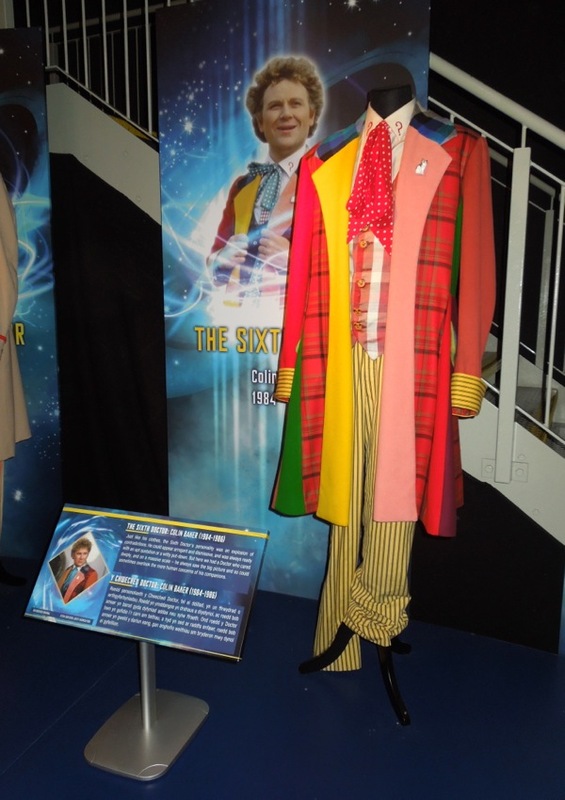 With every regeneration the alien 'Doctor' from Doctor Who not only finds himself in a new body, but he also possesses a slightly different personality, and more often than not his choice of clothes reflects this new persona. 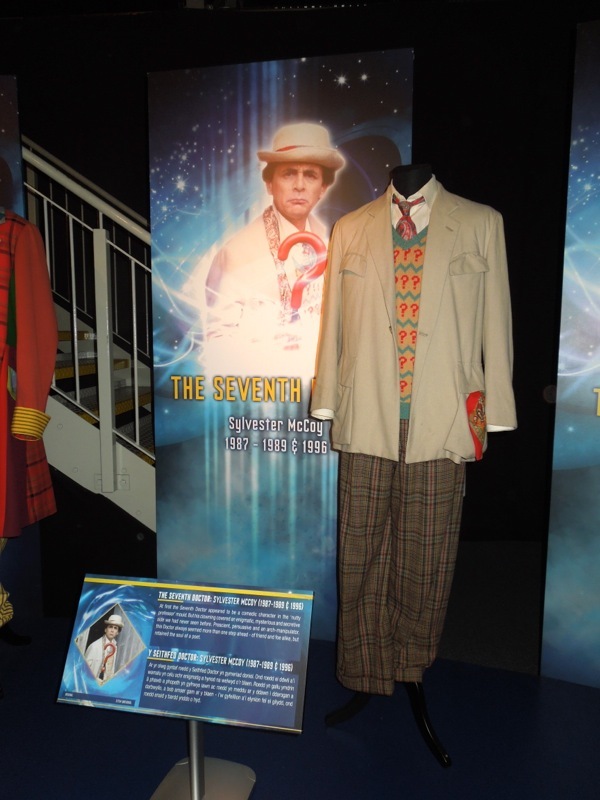 Yesterday I shared with you the costumes worn by the First through Fourth Doctor on display at the Doctor Who Experience in Cardiff Bay on May 20, 2013, and today it's the turn of the Fifth through Eighth Doctors, which were seen on screen from 1981 to 1989 and then again in the U.S. TV special from 1996. Here's where things get more personal for me as these are the Doctor Who episodes I remember watching the most when I was growing up in the 80's, plus following Tom Baker's iconic never-ending scarf worn by his Fourth Doctor, the next incarnations of the Doctor's attire became even more costumey in appearance. 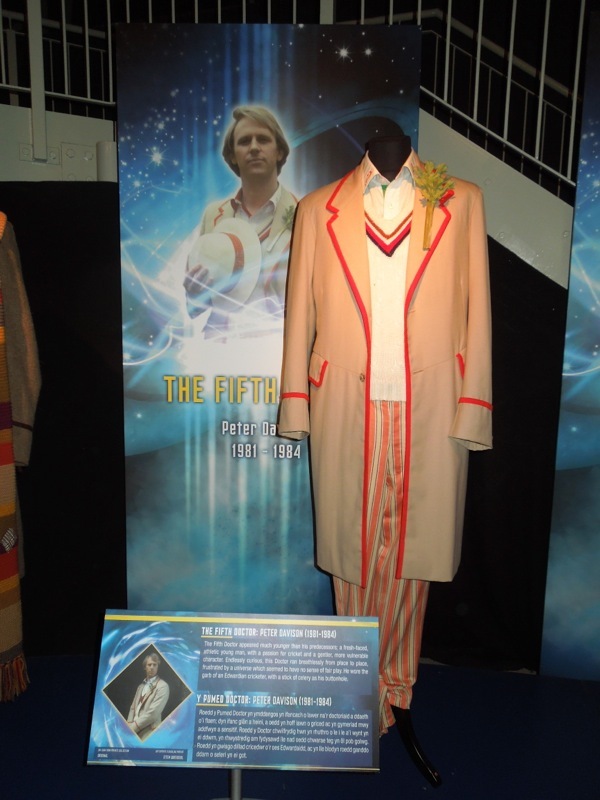 What a hard act to follow Peter Davison had when he became the Fifth Doctor, after a much beloved seven season stint by Tom Baker, but fortunately this very different Time Lord was already familiar to the British public through his role as vet 'Triston Farnon' in the BBC drama series, All Creatures Great and Small. This revitalised Doctor appeared physically younger and more athletic than his predecessors, always running from place to place. With a passion for cricket, this fresh-faced Doctor who was endlessly curious and more vulnerable, wore the lighter garb of an Edwardian cricketer, with a quirky stick of celery for this buttonhole. 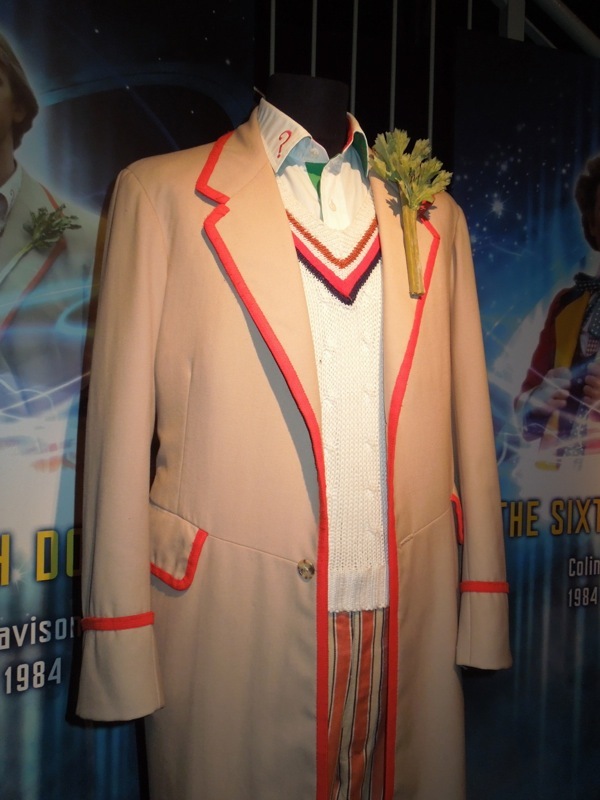 Plus notice the irreverent question mark detail on his shirt collar, which had first been added to Tom Baker's attire in 1980. 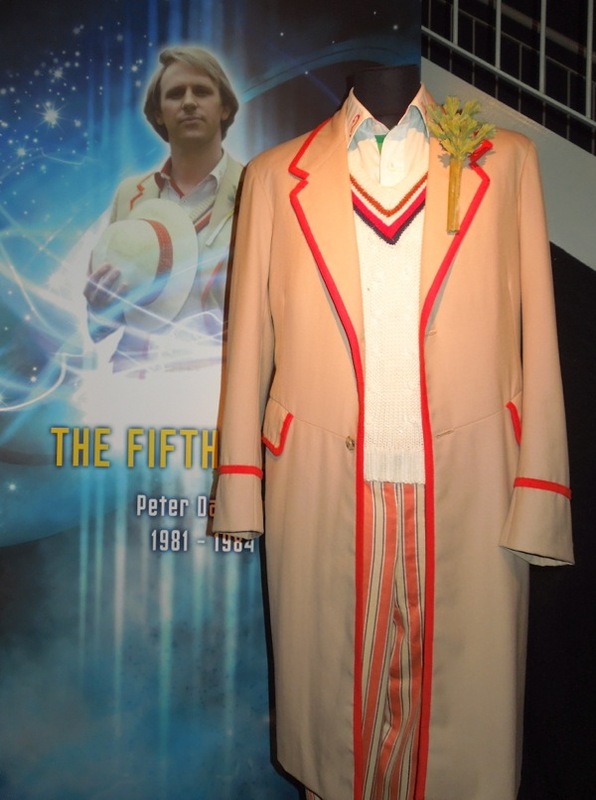 The three Companions I most remember during his three year stint were 'Tegan', 'Nyssa' and 'Adric', mainly because of Adric's shocking death in a crash involving a Cyberman-controlled freighter in the serial 'Earthshock'. 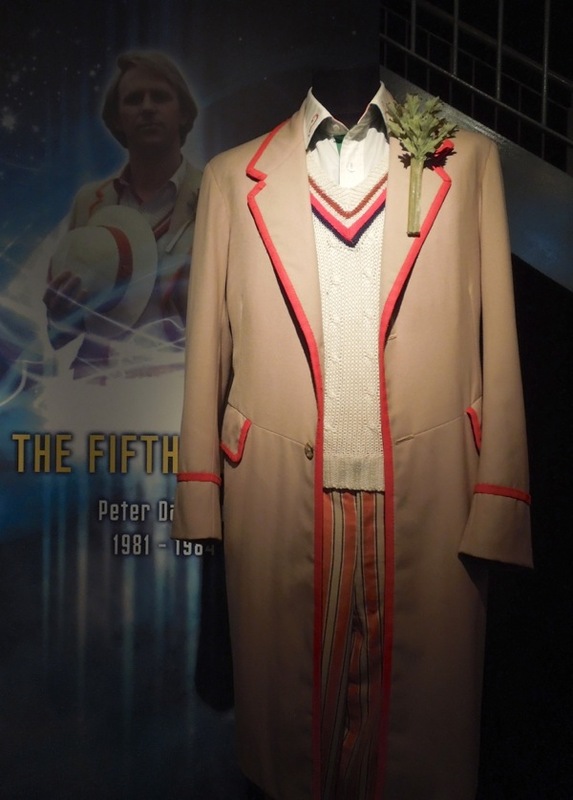 His death deeply affected the Gallifreyan and his friends (and me viewing at home), and Adric is the last word that the Fifth Doctor says before regenerating into the Sixth Doctor. 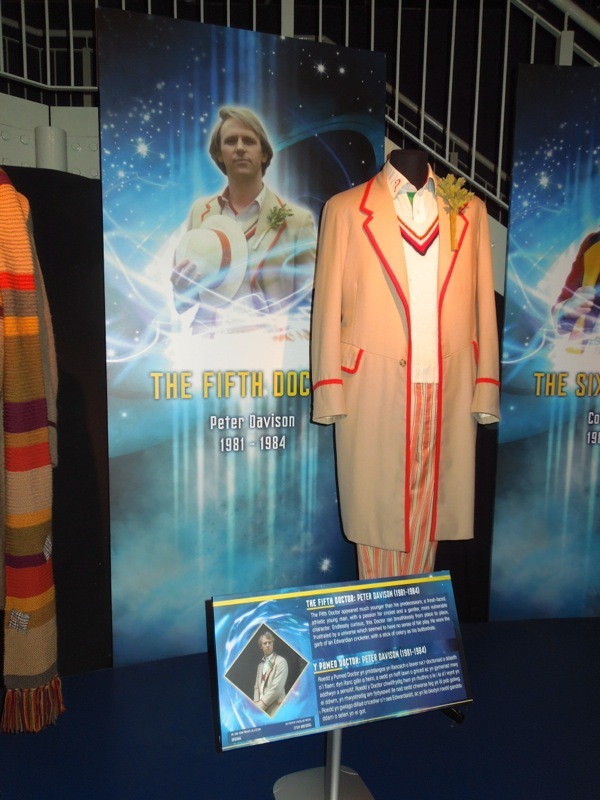 And if I'm honest, Peter Davison was my favourite original series Doctor. 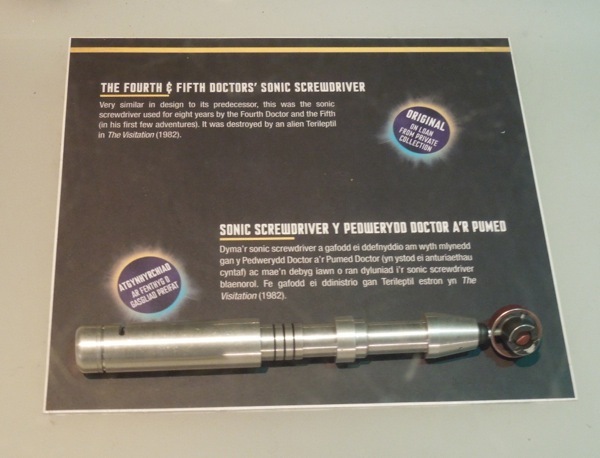 In addition to his original costume his handy technological marvel, the Sonic Screwdriver, was also on display, which was used by both Fourth and Fifth Doctors until it was destroyed by an alien Terileptil in 1982's 'The Visitation'. 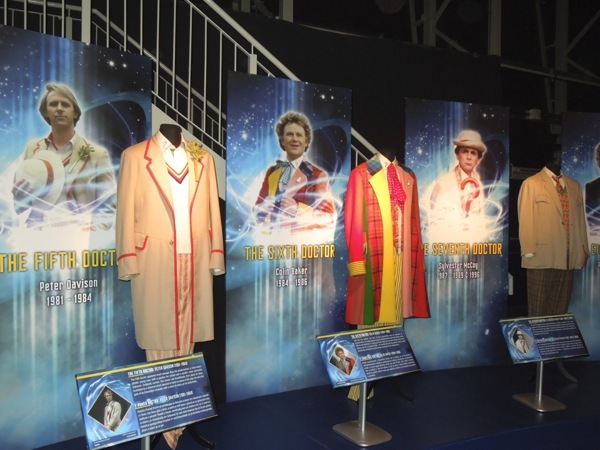 Poor Colin Baker, although he's not related to the Fourth Doctor, Tom Baker, you can't help but feel he was compared to the other actor. 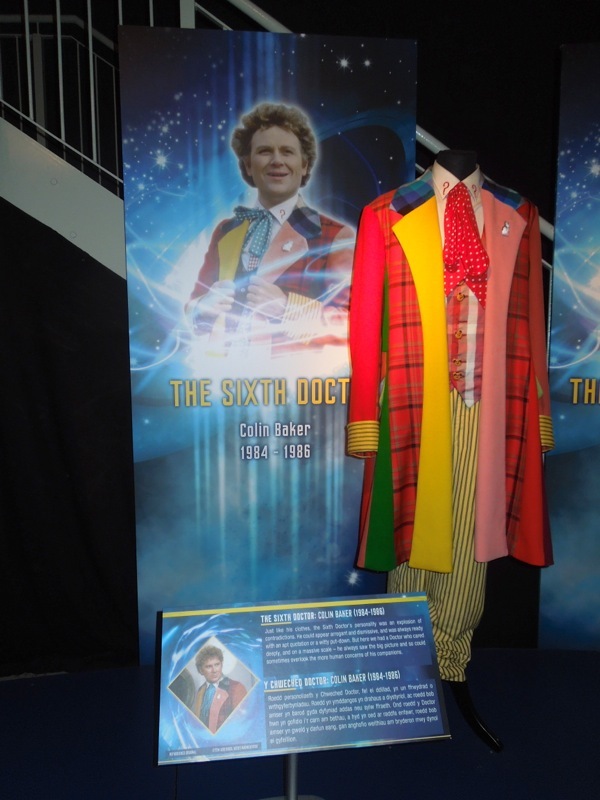 The Sixth Doctor first appeared at the end of the final episode of 'The Caves of Androzani' and I have to say he's my least popular Doctor (along with his whiney Companion 'Peri'). 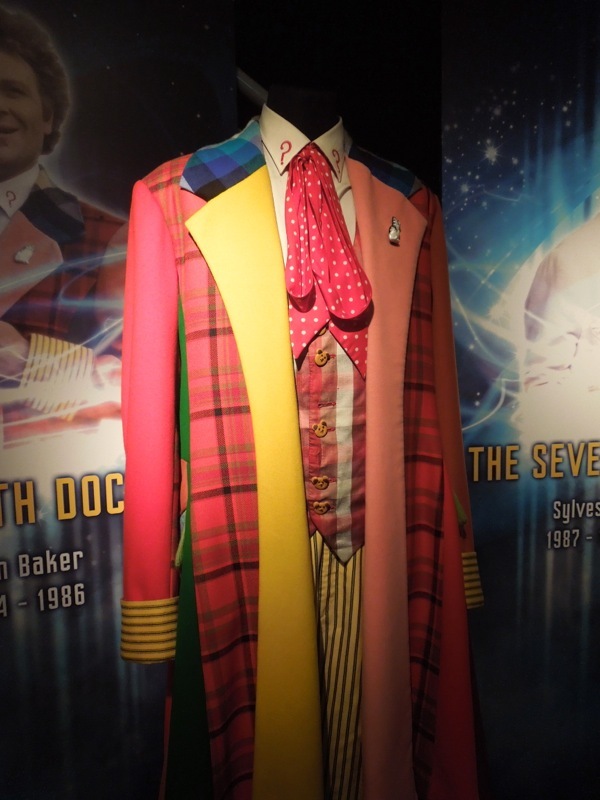 This incarnation of the infamous Time Lord is probably one of the most divisive amongst fans, from his brightly-coloured, childlike patchwork costume to his arrogant and explosive personality. Overall, I didn't think he was particularly likeable, although it has to be noted that during this time the powers-that-be at the BBC weren't particularly supportive of the long-running sci-fi show. 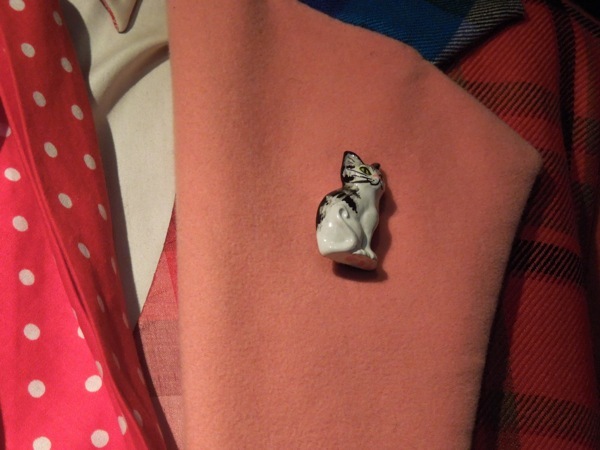 His outfit is just such a riot of colour and fabrics, with childish teddybear buttons and cat pin, that it's really hard to take seriously and does make it look like the costume belongs firmly in the land of children's television. 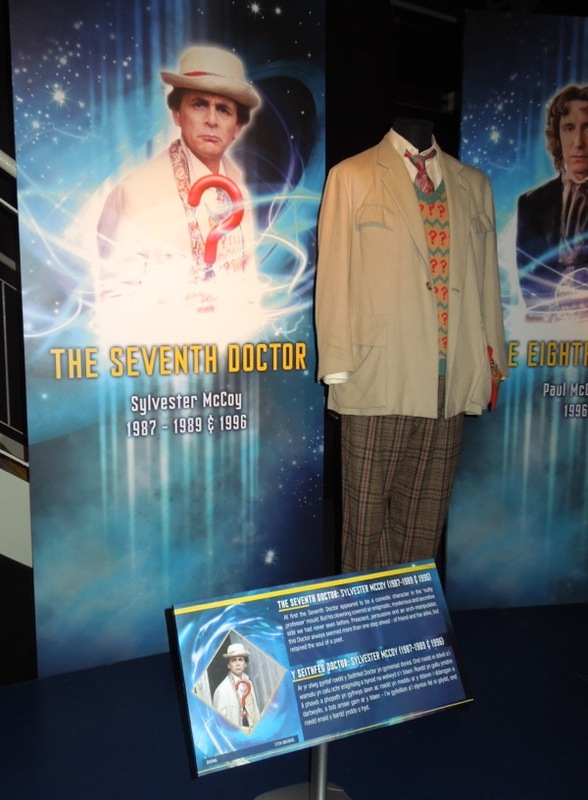 Moving swiftly along to another of my favourite regenerations and the far more likeable Sylvester McCoy as the Seventh Doctor. Initially this incarnation appeared to be more of a comedic 'nutty professor', but we soon learned that this demeanor merely hid a more enigmatic, mysterious and secretive side than we'd previously seen. Plus even though he abhorred violence, he proved to be a persuasive and devious manipulator. 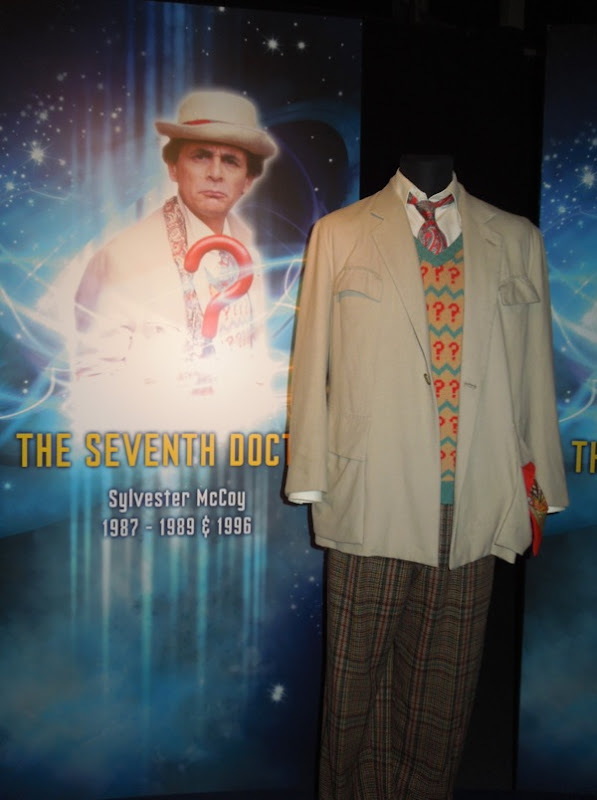 Even though the Seventh Doctor's costume was much less of a costume than his predecessor, his sweater still retained a a nod to the show's 'Doctor Who' title, being covered in question marks, plus he also sported an umbrella with a question mark handle. 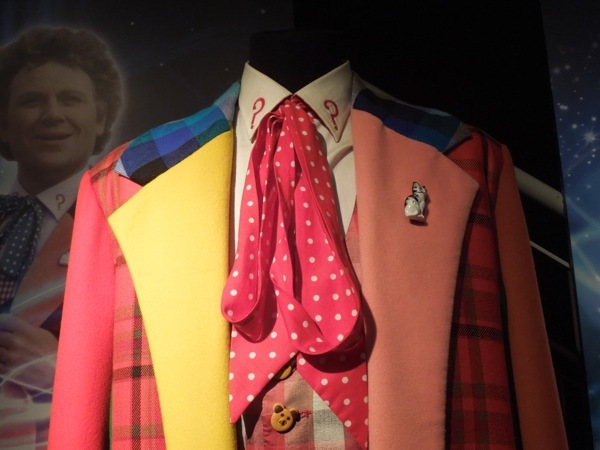 I was also a fan of his plucky teenage traveling Companion 'Ace' and her cool explosives, although I was pleased to say goodbye to Bonnie Langford's annoying 'Mel Bush' holdover from the Sixth Doctor era. Sadly this incarnation of the Doctor marked the end of the twenty-six year old show, which was cancelled in December 1989. But this was not the last we'd see of the Seventh Doctor, as he popped up for a special cameo at the start of the American TV movie in 1996, in a slightly refined outfit, when he was gunned down in the middle of a gang shoot-out, causing him to regenerate. 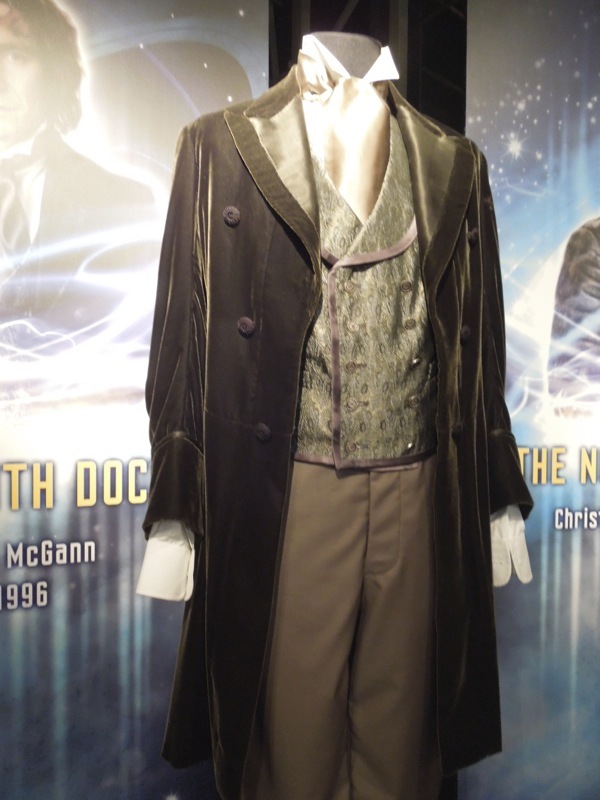 He only appeared in one movie-length adventure, but Paul McGann made an enormous impact as the Eighth Doctor in 1996, as this was the first Doctor Who TV story viewers had been able to enjoy in seven years. 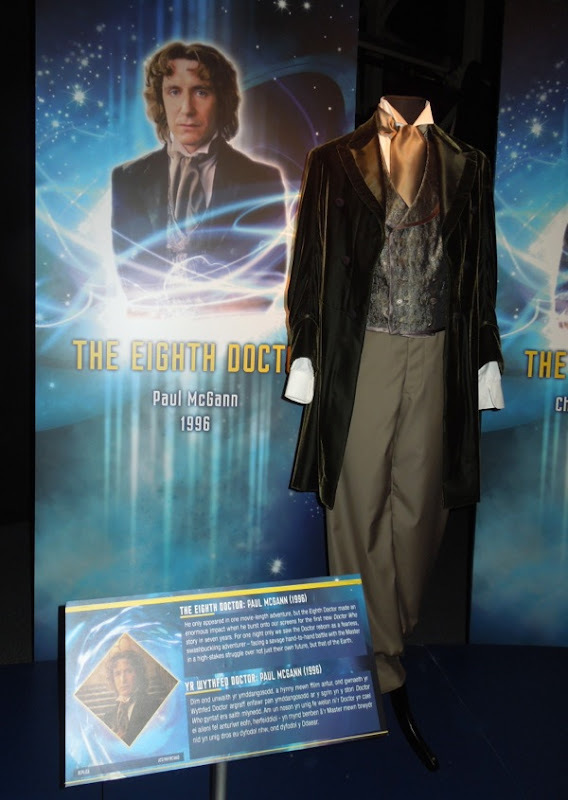 This version of the time and space traveler was much more adventurous and hands-on than previous incarnations, and he clad himself in a much more romantic 19th century frock coat and shirt and conveyed that man-out-of-time persona. On this adventure he teamed up with 'Dr. Grace Holloway' (and even uncharacteristically kissed her) to stop his arch-nemesis and fellow Time Lord, 'The Master' from destroying Earth. Sadly this one-off movie event didn't spawn a new on-going series and we were made to wait another nine years for Doctor Who to be revived in the hands of Russell T. Davis. 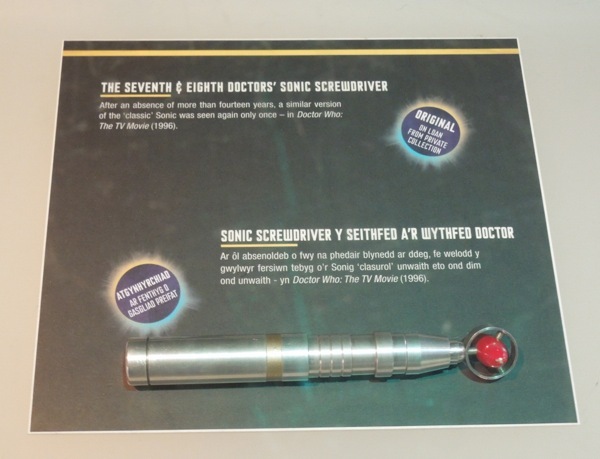 Also on display with his costume was this homage to the classic Sonic Screwdriver gadget from the TV movie, which had been absent from television screens for around fourteen years. 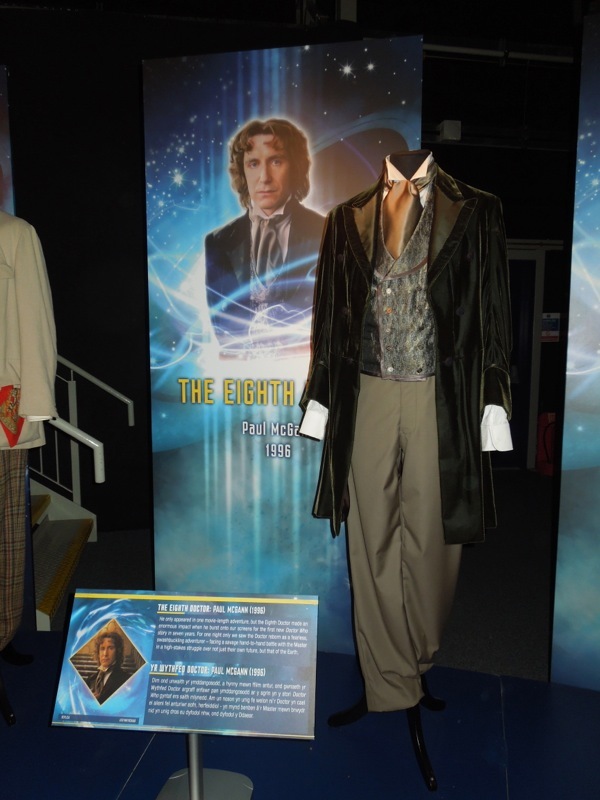 If you like these outfits worn by the enigmatic Doctor, be sure to also check out more original props, costumes and monsters from Doctor Who on display at this fantastic ever-changing exhibit. 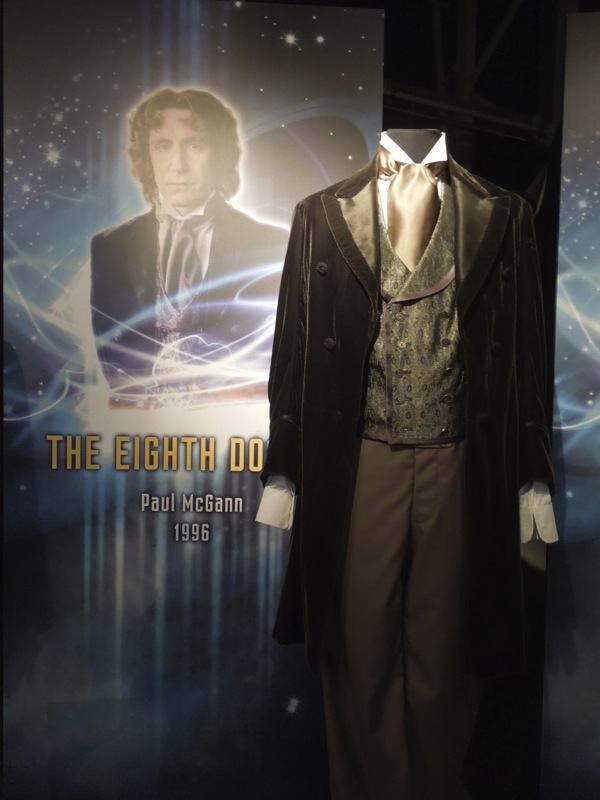 Too bad the Eighth Doctor outfit is not the one he actually wore in the movie. 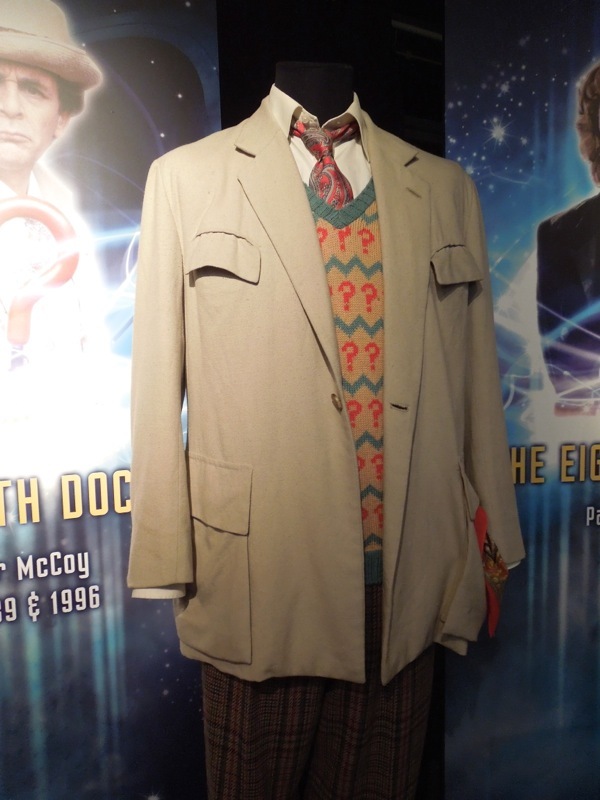 It is an okay remake of the actual costume which is not on display. 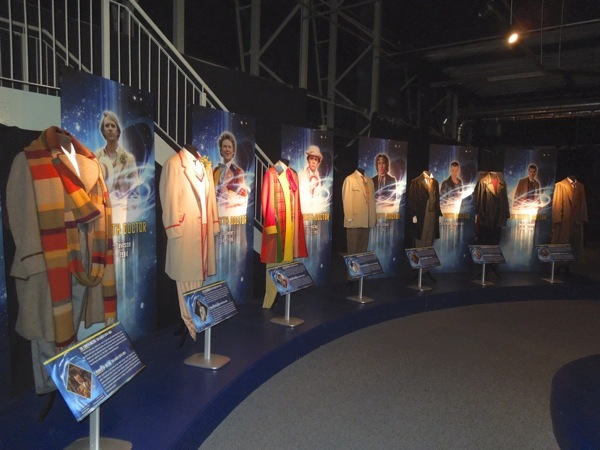 Even though there are some replicas, it's still pretty cool to see all the Doctor's costumes represented.